I've been celebrating all month! nice quiet dinner, just the hubby and I. This is a must have in our home!! good and very simple to make! We will be staying in for V-day. I tradionally make lasagna and homemade cookies. Megan will get a balloon and a little candy. 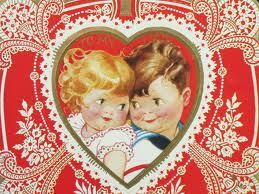 I will print off conversation heart bingo today and we will play that after dinner. Simple. Just the way I like it. Very smart to wait to dine out. It will be much more enjoyable without the crowd. Enjoy! May your heart be full of blessings and JOY! Thank you for always inspiring us to make sweet lovelies for our families!